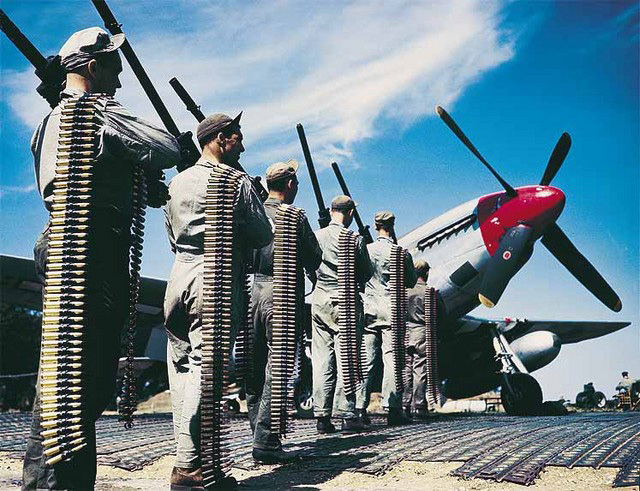 The North American P-51 Mustang was armed with six .50 caliber machineguns, the pilot had a total of 30 seconds firing time. UNSUNG HEROES OF WORLD WAR II: Most articles never mention the ground crew they were the men who kept the machines of war running. These unsung heroes worked long hours to keep their assigned fighter, bomber transport combat ready. Mechanics were enlisted men after basic training they were sent to technical schools some were kept on in the US and became instructors others became specialists in engine service and repair, electrical and fuel systems, airframe repair propellers, armorers. The Mustang was powered by the Rlls-Royce Merlin engine and they were sent to the RR plant to learn its operation. Crews did whatever it took, to keep the aircraft flying be it making the tools for the job themselves, borrow or even moonlight requisition the mechanics were creative specialists. Years after his wartime service, his son would ask, what did you do in the war daddy with a smile the veteran would say, with pride, Son I kept'em flying.